Posted on Fri, Mar 30, 2012 : 5:24 p.m.
Barnett Jones wipes tears out of his eyes after being saluted by members of the Ann Arbor Police Department Friday. The police officers stood at attention, following their new boss’ command. All of their eyes were directed toward their old boss, who was fighting to hold back tears. After all, a good leader never cries in front of his charges. And, outgoing Ann Arbor Police Chief Barnett Jones almost managed to control his emotions before taking off his badge one last time and heading into retirement. Civilians and police officers alike traveled from around the state to wish Jones well at his retirement celebration in the Ann Arbor City Council chambers Friday morning. Listening to testimonies from friends and colleagues spanning his 38-year career in law enforcement, Jones laughed at times but refused to bow to the emotion that many in the room were feeling. However, it was the words and actions of Deputy Chief John Seto, the man Jones groomed to take over the head job at the department, which moved Jones to tears. Seto called all the active police officers in the room to stand at attention and salute the 53rd chief in the history of the Ann Arbor Police Department. 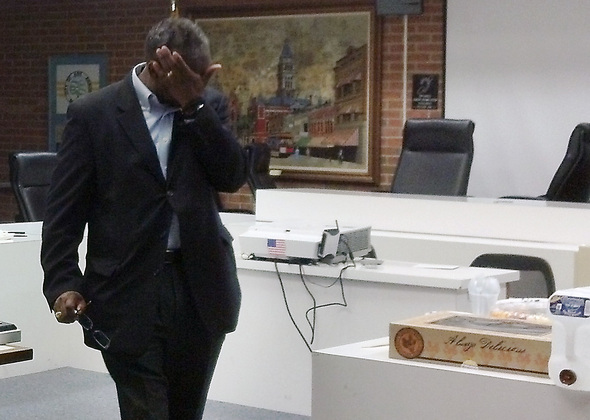 After the moment passed, Jones rubbed tears out of his eyes — a man overcome by the tradition of a department he loved. “Every decision he has made was based on what was best for the people of this organization,” Seto said. About 125 people gathered inside the council chambers to say farewell to Jones. It was a showing that many of the assembled speakers said is a testament to the personal relationships Jones cultivated during his decades of service as a police officer in several southeastern Michigan departments. Jones’ first day as Ann Arbor’s police chief came on June 1, 2006, and his last day was Friday. Prior to that he had served as police chief in Sterling Heights and had a long career with the Oakland County Sheriff’s Office, Inkster Police Department and Wayne County Sheriff’s Office. Among the speakers was former City Administrator Roger Fraser, the man who hired Jones back in 2006. Fraser said Jones didn’t need to be recruited — in fact, he was the one who was all too ready to come to Ann Arbor, the place where he was born. Fraser said Jones’ remarkable kindness to all he encountered was something he’ll never forget. One of the more entertaining tributes came from Washtenaw County Public Defender Lloyd Powell, who introduced a bit of drama into his speech. Powell said he believed Jones had set the standard for leadership of the police department in the way that Shakespeare set the standard for writing and Michelangelo set the standard for painting. Jones made $126,500 per year as chief of police and is eligible for a pension under city policies that allow firefighters and police officers to collect at age 55 with five or more years of experience. Estimates show he could make about $20,000 per year with that pension. Jones has been forced to make deep cuts to the police department during the last few years as the city struggled with the economic realities brought by the recession. Although the budget outlook looks better for the police department this year, the fire department — which Jones also oversaw as public safety administrator — is expected to cut more jobs this year. Jones said the men and women of the Ann Arbor Police Department had endured one of the toughest experiences in law enforcement — having their colleagues lose their jobs and, in the case of Vada Murray and former Ann Arbor Deputy Chief Greg O’Dell, their lives. Jones said the people inside the department inspired him. He praised Seto, encouraging the city officials in attendance to remove the interim tag from Seto's title as soon as possible. Seto takes over as the interim police chief on Saturday. “There should be no transition,” he said. However, the loss of Jones to retirement clearly affected the city’s leaders. Mayor John Hieftje was soft spoken in his remarks, his voice sometimes cracking when speaking of the deep respect he had for Jones both professionally and personally. Hieftje said Ann Arbor wasn’t just losing one of its best cops, it was losing one of the most-well regarded people in law enforcement throughout the state. Sun, Apr 1, 2012 : 10:52 p.m.
Best regards Chief. Ann Arbor is going to be missing a great Chief. Take Care, thanks for being there for all of us. Sat, Mar 31, 2012 : 10:53 p.m.
Best of luck to you Chief!!! Sat, Mar 31, 2012 : 10:09 p.m. I'd be crying to , all the way to the bank with another sizable pension on top of the others. Sat, Mar 31, 2012 : 8:59 p.m.
What is Seto's perspective on marijuana? Sat, Mar 31, 2012 : 8:47 p.m. If the city decides to put Mr. Seto in as chief hopefully they will make him the Police Chief and get rid of that position called safety services director. This will save the city money and allow him to run the one department he is familiar with. Good Luck Chief Jones !!!! Sat, Mar 31, 2012 : 3:07 p.m. Sat, Mar 31, 2012 : 1:35 p.m.
&quot;Every decision he has made was based on what was best for the people of this organization,&quot; Seto said. I don't mean to be rude, but shouldn't the chief's decisions be based on what is best for the citizens of Ann Arbor? We pay the taxes that pay him and his organization. Public servants serve the public, not the organization. Sat, Mar 31, 2012 : 2:39 p.m. Yes, and I'm sure he knows that, but his biggest struggles in recent years were internal. Hard decisions to cut peoples jobs for the betterment of the organization and the City. Sat, Mar 31, 2012 : 12:51 p.m. Sat, Mar 31, 2012 : 12:11 p.m.
Good Luck Mr. Jones. Enjoy your retirement with good health. And to the Ann Arbor news it's no bodies business what amount of money he gets. Sat, Mar 31, 2012 : 12:35 p.m.
Evidently it starts with a &quot;store bought&quot; cake. Sat, Mar 31, 2012 : 12:30 p.m.
To the extent that his retirement is funded by taxpayers it certainly is somebodies business. One of the &quot;downsides&quot; to public service is the public is your boss. As tax payers we all have a right to know how and where our tax money is spent. Sat, Mar 31, 2012 : 10:36 a.m.
Is that a store bought cake? 38 years of public service and he gets a store bought cake? Sat, Mar 31, 2012 : 3:40 p.m. Sat, Mar 31, 2012 : 11:03 a.m.
Yeah, I thought he would at least get a &quot;Fudgie the Whale&quot; ice cream cake from Carvel. Sat, Mar 31, 2012 : 3:31 a.m. Sat, Mar 31, 2012 : 1:41 a.m.
Good luck, Chief. Remarkable career. Sat, Mar 31, 2012 : 12:47 a.m.
Fri, Mar 30, 2012 : 10:46 p.m. Appreciation and best wishes to you, Chief Barnett Jones. Remember in the words of Ivy Baker Priest - &quot;The world is round and the place which may seem like the end may also just be the beginning.&quot; Enjoy your well deserved retirement.